(Der More wijch ende van Fernagute. Charlemagne rides in from the left on a white horse, wearing a crown and bearing a lance. Prince Feurre, who can be identified by his crown, is falling from his steed who turns his head towards his master, brow puckered. 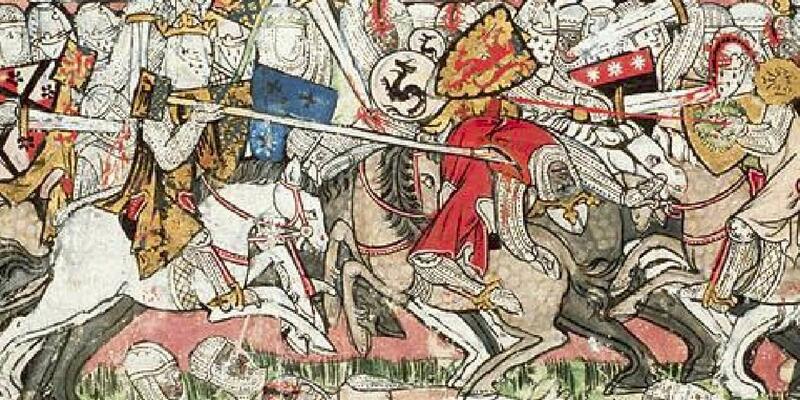 Beneath Feurre and his horse lie various Saracens, black and white, who have fallen in battle. It is curious that the miniaturist chose to include black Moors in the picture as the colour black is not mentioned in the text. However, the Roelantslied (La Chanson de Rolande), which is also found in this manuscript, does describe the Saracens as ‘Blacker than a besinged swine’; surprisingly, there is not a black Saracen to be seen in the miniature that accompanies this particular passage. The artist may have chosen to incorporate black figures in this miniature for visual reasons. An almost identical combat scene with the Saracen Agolant appears on the next page so he may have decided to add black enemies in order to avoid repetition and introduce depth. His choice of this subject for the miniature may also have been governed by the fact that Prince Feurre is explicitly called a Moor and not a Saracen in the text. In the Spiegel Historiael the Bruges writer Jacob van Maerlant 1225 –1291 told the history of the world from the Creation to the First Crusade in 1096 –1099. Count Floris V of Holland and Zealand 1254 –1296 inspired the writing of the first Spiegel, which subsequently became extremely popular. Today a total of some 60 parts has been traced, in various manuscript copies. This specimen from the Koninklijke Bibliotheek in The Hague is the only known illustrated version of this history of the world. The names of the miniaturists are unknown, as is the identity of the individual for whom this manuscript was intended.